I have participated in a zillion so-called brainstorming sessions in my life and I can't remember one that was very productive. Now I know why: They simply don't work! In his concise piece seven weeks ago in The New Yorker magazine, Jonah Lehrer gave an excellent overview. He starts with a brief history about how the term was coined, coincidentally during the year I was born, by someone who was at the time about the age I am now and who wanted to share some perspective. One of this gentleman's ground rules was the stipulation that brainstorming sessions must never include critical thinking, criticism or negative feedback. I've probably heard that a zillion times too. But the article is more about when and how creativity works well as a “group process.” The article is well worth reading and rereading, especially the part about what determines successful Broadway Musical productions, even though that genre is not among my favorites except, of course, for the occasional popular power ballad which is often spawned. 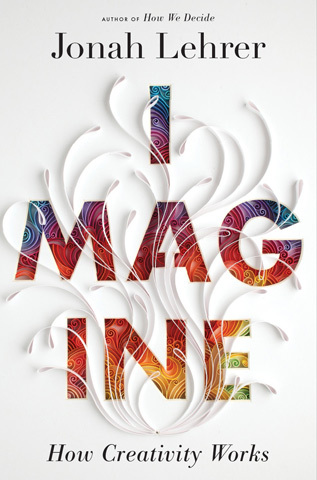 Lehrer is also the author of a great book out just this month entitled Imagine – How Creativity Works. Based on the article, I'm thinking that the problem in Congress and in many state legislatures today is not that there is too much partisan debate but too little. At the heart of so much dysfunction in those bodies is too little willingness to be exposed to contrary ideas and too little willingness to let them inform changes of opinion. What if so-called “flip-flopping” is really a very positive ability to seek out and listen to differing opinions and then having the flexibility to let that moderate rather than harden previously-held conclusions. “Flip-flopping” as you know, is a characteristic for which both President Obama and hopeful Republican Party-nominee Mitt Romney are both criticized. Krista Tippett's radio show On Being still doesn't appear to be carried by the public radio station of which I'm a sustainer, so while I'm working on blog posts I listen to podcasts or read transcripts delivered to me via e-mail , which is far more convenient anyway. The interview a few days ago with Dr. Rex Jung was entitled Creativity and the Everyday Brain. Interestingly, Jung is a neuropsychologist researcher who studies both intelligence and creativity at the University of New Mexico-Albuquerque. His inspiration to venture from intelligence into creativity came from his work with the Special Olympics. People I often affectionately call list checkers hate to get off that superhighway and often form opinions with far too little information and devoid of creativity. But the interview notes that you can't “meander forever.” Eventually, you need other parts of your brain to form and test hypotheses, something that is equally irritating to list checkers. Maybe they just don’t like the on-off ramps? To me, I took the traditional form of brainstorming as meandering far too long and that the part of creativity where hypotheses are formed and tested is what makes sessions that permit critical thinking and evaluation so much more productive. So I guess that's why I can seem to be equally irritating to both list checkers and Pollyannish creatives. With all of this in mind, I'll still participate in brainstorming sessions when invited, but also suggest that they be accompanied by individual brainstorming sessions and that, when were together as a group, we are able to evaluate, debate and analyze ideas without getting personal. I’ll report back on how that goes. If the original ground rules have persisted more than five decades after they were debunked, I can imagine it may take facilitators to be much more open to contrary ideas before we see brainstorming practices begin to evolve and catch up with brain science.